Uzbekistan Airways has selected GEnx-1B engines to power four new Boeing 787-8 aircraft ordered by the carrier in January this year. The powerplant contract is valued at over $230 million, including a custom-ordered spare engine. Deliveries are scheduled to begin in 2018. GE awarded Uzbekistan Airways its TRUEngine designation for the entire GEnx fleet. The companies also agreed to promptly enter discussions to execute a TrueChoice agreement for the GEnx-1B engines. “Our cooperation with GE Aviation is a major step forward in expanding international business relations for Uzbekistan’s flag carrier. 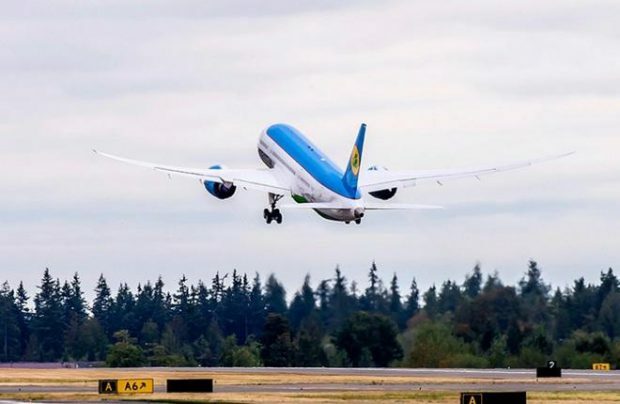 Uzbekistan Airways is proud to be the first Central Asian operator of the Boeing 787 Dreamliner equipped with high-performance GEnx-1B engines,” said Andrey Margachyov, deputy director of operations at Uzbekistan Airways Technics. In 2016, the airline accepted delivery of Central Asia’s first Boeing 787 powered by GEnx-1B engines. The aircraft was the first passenger airliner based in Uzbekistan to be equipped with GE Aviation powerplants. The carrier currently operates two airliners of this type.